Boy does it pain me to write those words. 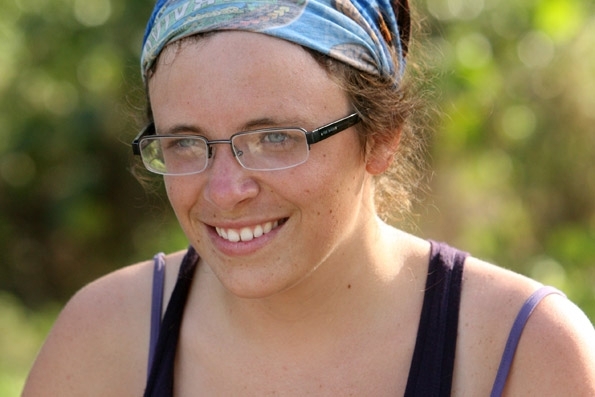 If you remember a post I did early in the season talking about my past and present Survivor Fantasy League Winner Picks, you will note that I had chosen Mikayla as my pick for winner this season. I was so sure that she would be able to pull off a win against Christine, and she would have won if she’d either been a little quicker getting her boards off the initial box, or had noticed her two inverted boards in the puzzle portion sooner. But alas, Christine’s coolness under pressure prevailed and sent my girl packing. Thankfully, those of us who lost our picks get to make a switch to another (worth less points than the original of course) at the merge. Who will my second choice be? At this point, I may go with Sophie. She’s very intelligent, seems to be a central focus of a good alliance, non-threatening but holds weight in decisions made by the core. A great position to be in. So now, what lesson can we learn from Mikayla’s journey? 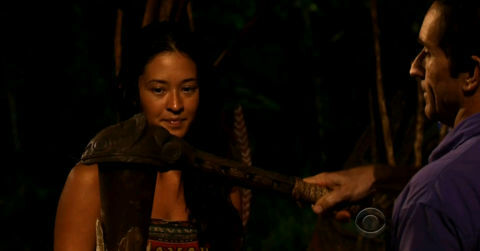 I’ve already discussed Brandon’s obsession with her that was integral in the way that the tribe saw her. So instead I’m going to focus on the bidding war that happened concerning her importance and the question, Strength or Loyalty. The war over Mikayla happened between the two most in-control members of the Upolo tribe, Coach and Albert. Albert, featured in the picture at the top, and Sophie was all about keeping the tribe strong to the merge and ousting the significantly weaker Edna who adds nothing to the challenges. Albert’s whole view was coming from a baseball coach’s standpoint. You keep your team at it’s strongest possible in order to reach the merge/goal with the controlling numbers. Fewer tribal councils equals controlling interest in the merged tribe. Coach (along with Brandon) was coming from the view of loyalty (as he always seems to cling to the ideal, but never REALLY follows through), and that even though Edna adds nothing physically, he can keep her reigned in and controlled when the merge happens. Her loyalty isn’t shaky like Mikayla’s might be. Considering Mikayla was not in the core alliance and constantly left out of the loop. He saw her as a loose cannon coming into the merge, a possible mutiny to the other side in the making. So where do you stand? Is it loyalty or strength that should be given priority? I’ve heard many times in dealing with business, the person you send to do the talking for your company should not necessarily be your strongest salesman. It should be the person you trust to represent your business the most. During her tribal council, I found myself at first siding with Albert and strength. Yes, I agreed, you have to make it to the finish line first as strong as possible before you start worrying about loyalty. He was quoted as saying, “Loyalty can be faked, strength can’t.” Which is so very true. And that’s the chance you take when you have to make that decision. She could be playing everyone, and even Brandon said he felt like Edna was faking everyone out. With her definitely knowing she’s number six in the alliance, she could very well be a quick flipper to the other side. She’s smart like that, and we know that she’s been amping up her social game since Brandon gave her that info. In the grand scheme of it all (and trying to be unbiased), Coach’s move was probably the smarter move for the rest of the tribe as individuals. Yes, Mikayla was a strong presence in challenges, but would she have had anyone’s back going into the merge? Not sure. I know through interviews that she was particularly close with Albert and Sophie but we definitely saw that they were closer to Coach (as they kept the idol a secret from her). 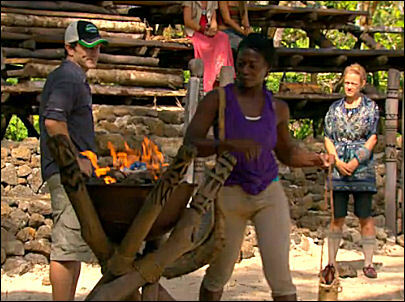 And taking Edna into the merge pretty much secures one person that can be beat in the individual challenges. The Survivor game isn’t all about athletic ability, it depends more on social ability. I totally believe that if Mikayla had been sitting on the beach when the alliance of five/six had been formed instead of Sophie, her story would have been totally different. By not being in the alliance, she had already secured her spot as an outsider and disposable. 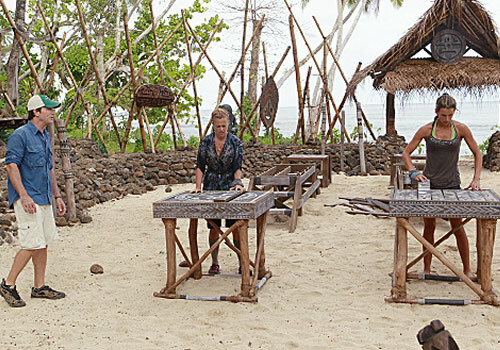 Just like Christine and Stacey, strong women were all voted out of the tribe for lying outside of the alliance despite having a weaker member in Edna. Half the journey to being successful in anything is having a strength or talent, the other half comes in with the people you know who help you get there. Relationship with others is what held her back. I wish her social game had been a bit better, but it was a pleasure to watch her. She got a lot of great air time and storyline. 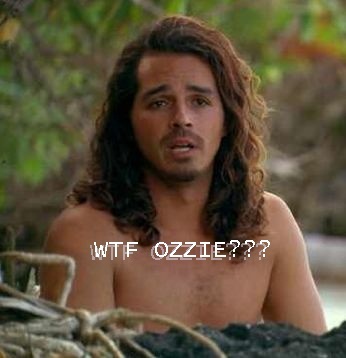 The other big thing that happened this episode, Ozzy intentionally having himself voted out and giving his idol to Cochrane “to hold onto until he gets back.” Hasn’t he seen how vile Christine is towards her former tribe and how likely a candidate she is to join forces with them? He wants to take a possible strong ally out of the game instead of sending Cochrane and securing her possible vote and re-entry into the game? Ozzy called himself a free agent at the beginning, but it is really Christine who’s the free agent… really Ozzy, wtf? 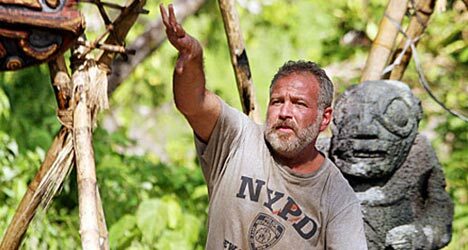 Catch up on the other Survivor Lessons Posts! Wow, who would have expected Jim and Cochrane to have pulled off the Elyse blindside as well as they did. 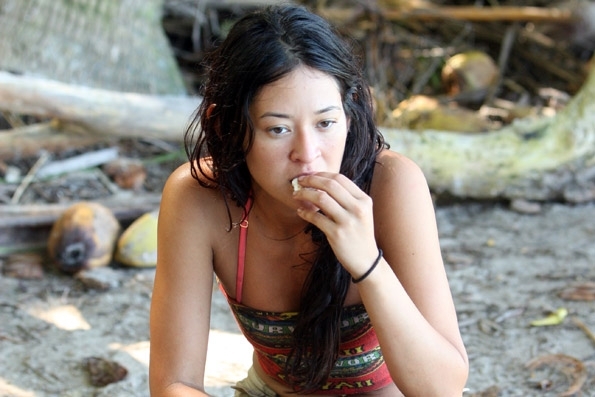 I remember sitting at her tribal council and telling the beau that I bet Keith and Whitney vote for someone else so that they don’t “really” vote against her per se. And they did! Totally awesome blindside but not so good for poor Elyse. 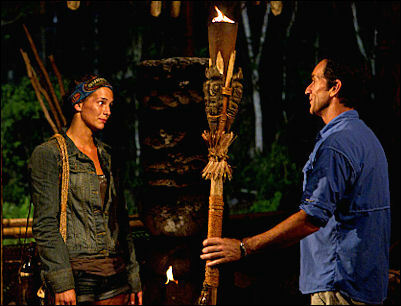 So what lesson can we learn from Elyse Umemoto and her experience on Survivor: South Pacific? The main thing I think we can get is that sometimes in life we are a victim by association. We have to be careful at times of the situations we put ourselves in and the people with whom we get involved. Even though she wasn’t a threat to any of the other members of her tribe, it was because of her close association with Ozzy and his actions that she was deemed a target. There are many times in life where people will want to hurt you but instead of hurting you directly, will hurt someone close to you. We see this unfold a lot of times when it’s dealing with relationships and friendships where a trust has been betrayed or a direction had been taken that didn’t honor a person or their feelings. How many times have we seen ourselves or friends instantly dislike the new person an ex is dating, or the new guy who took over our place as “best friend” and doing all the things you used to do with them. And how many of us have actually tried or even slightly entertained the thought of sabotaging that new relationship? Or how about it happening to us? The focus was on making Ozzy weaker, and losing Elyse was only going to be a win-win for them. She’s not going to be all that missed for challenges and in the process they managed to reign Ozzy back and in a place of a more humble cooperation. If Elyse or Ozzy had been more aware of their surroundings and their tribemates, they might have been able to see a glimpse of it coming before it happened. I really doubt Elyse was ever in a game-playing mode though and so it probably would have been lost on her. Sorry you had to be collateral damage girl. Right on the eve of another elimination tonight on Survivor : South Pacific, I’m finally able to sit down and give my opinion on what lessons for ourselves we might be able to extract from Stacey Powell’s journey on the show. Stacey was a fun character to watch and to see react in the episodes. She was a great antagonist to throw up against Coach and his sometimes zen-like personality. She had sass and she liked to keep things real. But that’s where I think things faltered for her. She forgot that Survivor isn’t the real world, and that you can’t necessarily react like you would in an everyday scenario. In your real social life, you can escape the people and things you may not like and voice your opinion with little resistance. But Survivor is more like a work environment. You can’t escape your co-workers (fellow castaways) or your “bosses” (whoever may be in “control”), and you have to learn how to deal with them accordingly to best help you and when to hold your tongue when needed. What it all boils down to for us and for her is that sometimes you have to eat your pride and keep your opinions to yourself to be able to work with people you may dislike. We do this all the time, especially in the workplace. We may not necessarily like our bosses and co-workers, but in order to keep food on our table and money in the bank we have to reluctantly deal with people we ordinarily wouldn’t put ourselves in contact with. 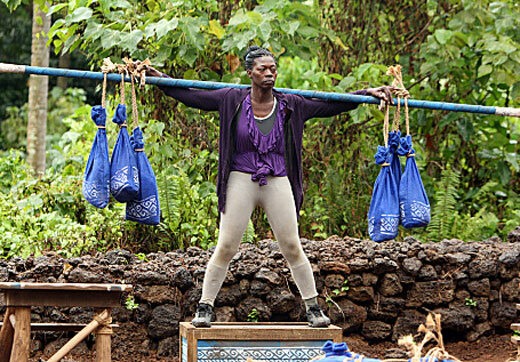 We all saw that Stacey was definitely one of the stronger women on her tribe by her great performance at the immunity challenge and usually by that merit alone, most tribes would have kept her. Just look at Mikayla’s experience on her tribe, she’s not in an alliance but noone was ready to throw her to the wolves when Brandon wanted to vote her out. She was deemed a strength asset and too valuable to discard. Dawn, up to this point, has had a similar story as well. Even though both are currently “expendable,” it has definitely been in their benefit that they haven’t rubbed anyone the wrong way either. That said, I even found through a post-interview with her that the editing didn’t show us that she was pretty close with both rancher Rick and Brandon (as well as the edit-given bond with Christine). So we know that she didn’t totally just isolate herself. Her association with Christine at the beginning didn’t help her, but she definitely could have made up ground by giving in and at least tolerating the powers-that-be; Coach, Albert and Sophie. But by rooting herself as an oppositional force to their control, she put herself in the position of expendable. We never want to do that in the workplace. We do, and then we don’t get hours or we put ourselves into a position to be fired/terminated. Now I’m not saying we always have to be the good little soldier and do everything we are bidden by an individual we totally dislike. What I am saying is that in this world there are times when we need to look at our situations and feel out what we need to do that would best help our hopeful outcome. You may not get along, but when you look at things in a business-sense you can definitely learn to make things work your way even if you don’t gel with the people. With Edna being physically weak and an alliance straggler and Brandon being a social disaster to his alliance, with a little work Stacey could have definitely kept herself alive long enough to survive through their oustings. I will def miss Stacey’s great facial expressions though. So, what do you all think was Stacey’s biggest hurdle? 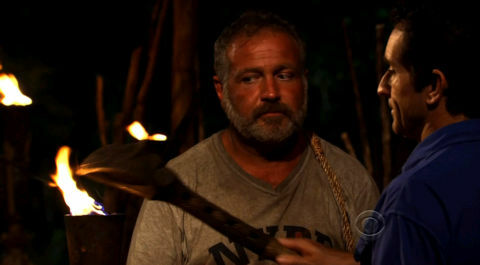 Papa Bear/Mark Caruso was eliminated from Survivor: South Pacific this past Wednesday. He was an interesting character, had a great accent, was very self-aware and fought hard to stay alive game-wise. So what can we learn from Papa Bear’s journey and where he went wrong? For me, I believe it was because he saw himself as an outsider to begin with and really made no headway to change that outlook as he reinforced it through his actions. Even though he said he liked it, I believe it was a mistake for him to allow them to call him Papa Bear so early in the game. Coming into any kind of situation with strangers, having people know you only by a nickname can help in further isolating yourself from them. It lacks a depth of personality and is like wearing a mask. In a familiar setting, getting people to know you first as a person is always best matched with a real, tangible name to attach with the face. Then you can add the nickname when the relationship is already forged and they don’t just see you as that facade (whatever that may be). In fact, it’s almost better for the relationships if you’re cohorts give you a nickname. It forges a bond/connection between you and them. I’m willing to bet that most of his tribe had forgotten his real name by the time tribal council had come around. He also immediately singled himself and Dawn out as the “oldest” ones and Cochran as the “geeky guy” and just left it at that. As far as we know or are shown, Papa doesn’t attempt to make any friendships or alliances with anyone and you’re most likely doomed if that happens. Granted, he’s shown talking to Dawn and Cochran on many occasions but it looked more like he was talking “where we stand in the tribe” than anything resembling familiarity. He allowed himself to wallow in the murk of “this is the way it is because of who I am”…most particularly his age. Even after her initial breakdown it appears that Dawn is not allowing her age to be a factor in proving her worth (though she is very aware of the age differences and how that could hinder her). Cochran’s managed to get through two tribal councils by admitting his faults and attempting to smooth things over with the others consistently. And even self-admitted awkward-guy-at-the-table Jim has (at least in a small way) found himself in with the popular kids. He didn’t allow his self-perceived image keep him from maneuvering himself into a decent position for now. But poor Papa Bear….oh yeah, I mean Mark… decided he couldn’t overcome his percieved flaw and gave into it. Even though he wanted to play the game so bad, he unknowingly sealed his own fate in it mentally. He limited himself just like all of us can. They won’t want me because I’m too short, skinny, fat, not smart enough, etc . Coming into an opportunity with self-image doubts can hinder us all in whatever it is we want to do. I have issues at times with my youthful appearance, big whoop right? I’m 33 and get mistaken for 18-24 alot of times, which is great for the most part. But I feel it hinders me sometimes when I’m interviewing for management positions or other jobs which stereotypically are filled by folks who looked older and more “authoritative.” I want to think they have an immediate bias against me because I may not look like I can gain the respect needed from employees and customers. It’s not about what you can’t do and your limitations. It’s about what you can do with your strengths. Though Papa had a good head on his shoulders and a mind for the game, I don’t think we got to see much of it because of his own self-inflicted limitations. So what do you all think was Papa’s downfall? Oh, and mentioning Papa hiding behind his nickname and it being a facade, reminds me of the song “Facade” from the Jekyll and Hyde musical. Great song and deep wording. We can all connect in some way. So where did Semhar go wrong? Ironically enough for a “spoken word artist,” I think it was her words that got her into more trouble than doing poorly at the immunity challenge. During inter-tribe introductions, Papa Bear put her on the spot to say a few lines after she gave her occupation. She promptly did so and then in a confessional said that if someone puts you on the spot, you need to step up and prove your worth and that proves that your word is good. Sounds great, she did what she needed to do. I’m not going to be a judge as to whether her poetry was awesome or not, but I do believe she has a lot of soul and belief in what she does though. 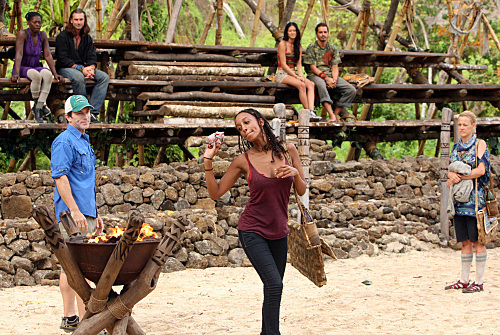 Then comes the immunity challenge and here is where Semhar messes up. Volunteering herself to do the coconut-tossing part of the challenge isn’t where she went wrong, it was selling herself too hard as the best candidate for the job when she really wasn’t. She very quickly grew exhausted and became a defecit to her team winning the challenge. In fact, they probably would have won if someone else had been in her place. The main lesson I believe we learn from Semhar’s experience is the old adage, “Don’t write a check you can’t cash.” Stepping up and volunteering to do the challenge is a good thing in itself, but selling yourself as the best choice of other candidates and then coming up quite subpar is what did her in. The truth of the matter is be adventurous, but also be aware of your limits and don’t impede your group (whether it be on Survivor or at the workplace). She said in her defense something like… “It takes guts to step up for the team and do what I did. Would you rather have someone who takes a chance and steps up or someone that sits on the sidelines?” My answer to that is conditional not concrete. I’d rather have someone who steps up and is able to put a worthwhile effort to whatever the challenge may be, but I’d rather someone sit on the sidelines if it is all talk and no action. Don’t limit yourself, but know your abilities when things get to be crucial for your situation. 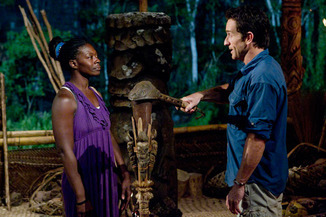 After the challenge she then tries to apologize for her poor performance, and here is where I think that she further lost her shot at staying. She does the correct thing in apologizing, but she went about it in a very routine, mundane way. There was no emotion or any conviction behind it from what we could see from editing. It was the cookie-cutter kind we see when a parent sees their oldest child messing with the youngest. The parent then tells the child-in-the-wrong to apologize to the other or else. And we see a very shallow apology that has no meaning or truthfulness to it. This was the kind she offered, and for a “spoken word artist” it was kind of disappointing the lack of emotion. Being sincere and honestly sorry about her performance probably could have kept her there another three days. Ozzie was supporting her, and even prompted her to do more politicking to keep herself there. The one scene we saw her talking to Whitney was a very poor case to keep her. No conciseness, sincerity, or even the slightest tone that gave the impression that she truly wanted to stay. Lesson number two, when you offer an apology, do it out of sincerity not out of necessity or in attempt to make yourself look better. Ah Semhar, we barely got to know you. 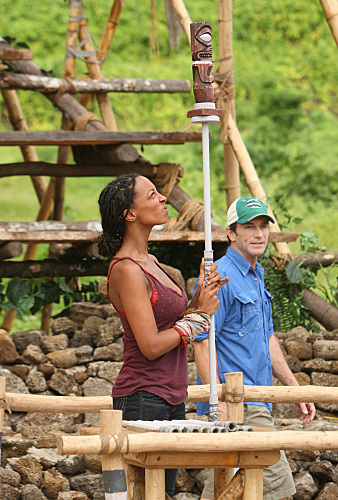 What do you think was Semhar’s biggest error to learn from?